Your guide to managing your health like the adult you are. Why You’re Here: Maybe it all just feels like too much to deal with sometimes, or maybe you’re looking for some confirmation that what you’re doing is working. What’s Inside: Some helpful tools to help you navigate a part of life that you probably didn’t read about in a text book or find a proper class for. This is the stuff you learn on the way and resources to help guide you there. How To Use It: Find out if these tips sound useful to you. Start where you are at. 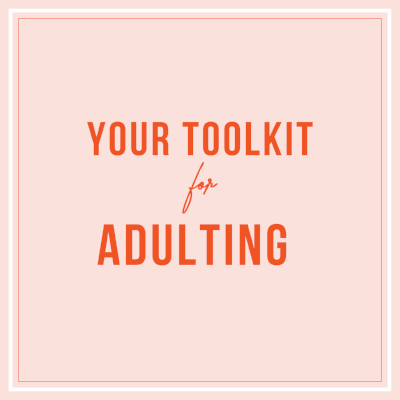 Take small steps to see how you can improve your adulting game. Healthy habits aren’t something you have or you don’t. They happen when you do the work to figure out what habits you need and then create space for them in your life. That’s where routines come in—and scheduling. Come up with a morning or daily routine. Maybe you start by drinking a glass of lemon water, taking a quick walk or doing a few stretches first thing after you wake up. Take your first step toward creating healthy habits that can set you up for a lifetime of success. Follow the morning routine of these women leaders Forbes profiles for their get-it-done style approach to the day. Do you want to try getting up earlier? Or, do you want to see if you can incorporate meditation in part of your day? Do some soul searching to identify a few habits you want to start. Identify the routines that will make you feel better by addressing needs you have, not just the ones that are trendy. Think of any of the logistical barriers keeping you from starting new habits or doing what you need to do to take care of yourself. Find out what they are and how you can find solutions to move past them and move forward to achieve your goals. Incorporate a few new habits into a simple morning and/or evening routine. Consider subscription services that help you stay on top of taking care of yourself like vitamins, produce and easy, healthy meals. Try out some life automation by setting up automatic payments for your billing or making sure your ongoing appointments are tracked on your calendar so you can set reminders for yourself. Audit the way you spend your time and re-prioritize, re-organize your physical space so it supports your goals. This is key when it comes to improving the space you both sleep and relax at. How to find/incorporate consistent night time routine when you're a night owl? It’s time to talk rituals for bedtime. It might be hard to adopt your new bed time or habits that help you sleep better, but they can help pay off for a lifetime, Business Insider reports. Start by unplugging before bed, give yourself an hour or two to really be free from the screens and blue light emitted by devices. Don’t work straight until bed, take time to stop and reflect. Make a plan for your sleep—determine how many hours you would like to sleep. The National Sleep Foundation recommends sticking to a sleep schedule, turning down bright lights and avoiding naps, especially in the afternoon. It’s also good to evaluate your room and the space you sleep in—is your mattress comfortable and supportive? Is it cool, between 60 and 67 degrees? Make sure you are also exercising daily, in order to aid your sleep it’s important to have vigorous or at the least some form of exercise each day. I feel like it takes me forever to start a new habit. Is this normal? It takes about 21 days to form a new habit. But you shouldn’t always expect your habit to change in that 21-day period. And according to Psychology Today, it’s more complicated than that. You might miss a day. You might get derailed. But that doesn’t mean you’re fully off course or that you can’t pick up or ditch a habit. The importance is not to get discouraged whenever you’re trying to start a new habit and keep trying. Stress reduction methods, including meditation, can also help to form new habits, TIME reports. You also have the power to identify a bad habit and replace it with a good, positive one. There’s never enough time in the day. How do I find time in a crazy busy schedule? It’s time to put you on the priority list. Yes. You read that right. Try a few tactics to find time in your schedule: Try waking up earlier, put time or schedule yourself using a calendar, stop feeling bad and start saying no. You can squeeze workouts in during your lunch break, workout with a friend and even make your bedtime earlier.